I hate Halloween. Every year I do my best to ignore it. However, I love contests. And every year my work hosts a Halloween costume contest. Dilemmas, dilemmas. Apparently I love contests more than I hate Halloween. How had I never noticed it before, Disney fan and knitter that I am? 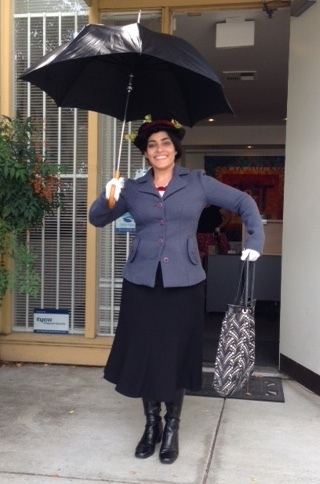 I decided to go as Mary Poppins this year … but only if I had her scarf! No scarf, no costume. My yarn stash is getting a little crazy as it is, and I’ve told myself no new yarn until I use up some up of what I’ve got. So, I fudged the colors of her scarf so I pull from the stash (and maybe earn the privilege to go yarn shopping again!). 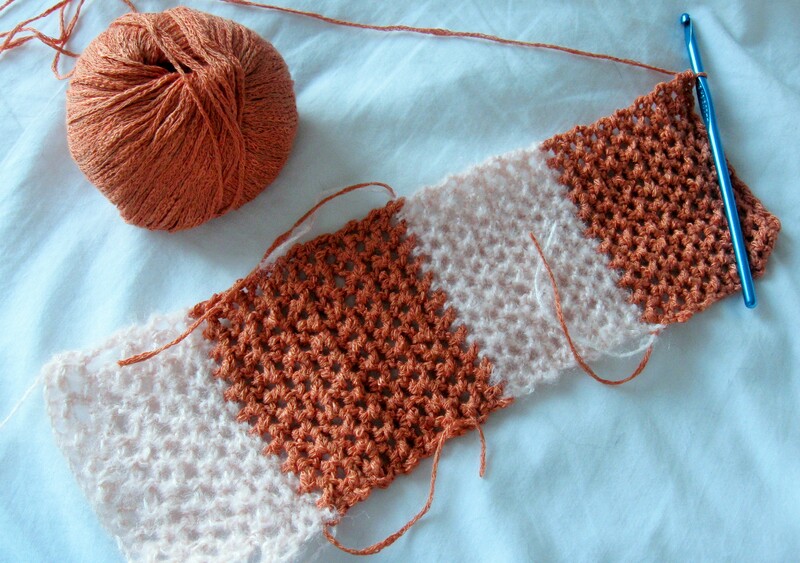 Mary Poppins’s scarf is more of a coral pink than a blush pink, and the orange stripes are more red orange. So my colors were “practically perfect.” (And yes, I’ve been overusing that phrase lately. It’ll probably show up a few times in this post. Hopefully it will wear off once Halloween is over.) It’s a simple crochet mesh pattern. The mohair was getting in the way of seeing the holes though. This is why I don’t work with mohair much! I only had eight stitch markers at my desk (markers I borrowed at that) to keep track of my spaces, so I had to improvise with safety pins and bobby pins. You can see them in the photo at the top. I thought it was rather genius, if I do say so myself! A DIY Stitch Marker hack necessitated by Halloween! My progress as of 4:30 p.m. on October 29 … no more time to procrastinate! Spit spot, as Mary Poppins says! Of course, I didn’t finish the scarf. 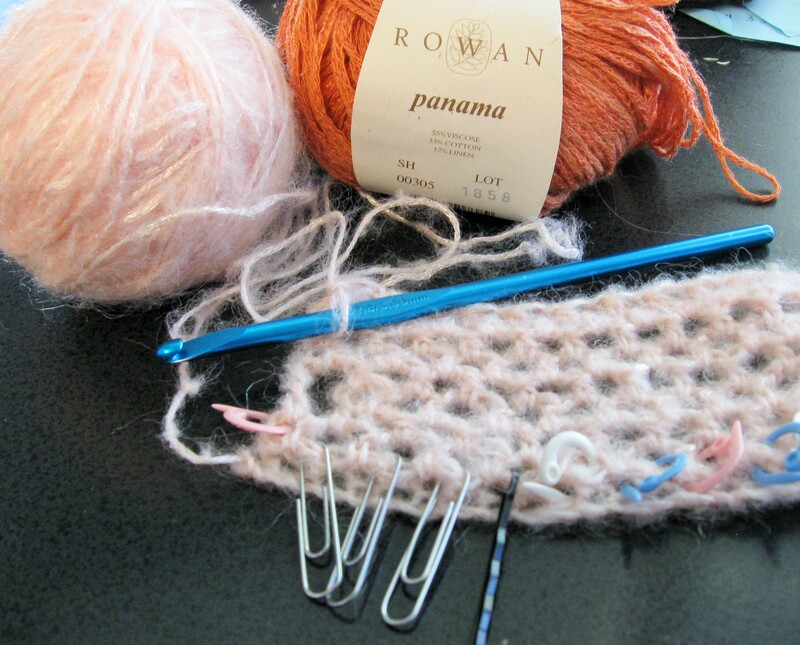 Really, what was I thinking being able to finish a whole scarf in two days? But by that time I had invested too much time to ditch the costume idea. And I had done too much research on Mary Poppins’s wardrobe. It’s an easy costume for anyone who needs last minute ideas (for the future … it’s noon on Halloween, so probably too late for this year). Ended up winning 3rd place. (You can see the winners on C&T’s Instagram.) Not too shabby. Plus, I got about half the office singing Supercalifragilisticexpialidocious. (Spelled that right on the first try, according to spellcheck! Ha! )—that was better than any prize! They should have never doubted that I know all the words! Sorry, the cell phone photo is a little blurry. Still, you get the idea. Fun fact: With my glasses off in this photo, I couldn’t see a thing! Hat: Take almost any brimmed hat, push in the top so that it’s more flat, then cover the whole thing in fabric. The fabric’s optional—I just thought it looked better that way. Mary’s actual hat is straw and has black trim that doesn’t show well in screenshots. Mine had red trim because it’s what I had. And yellow flowers (because that’s what I had). One of my coworkers used to be a costume designer, and she said it’s all about the silhouette. Good to know for future costumes! Blazer: In the movie, Mary Poppins wears a black overcoat while flying, and she replaces it with a navy blazer when that she takes off and replaces with a navy blazer. The blazer and skirt have a silver stripe, but I skipped that. I wasn’t going to sweat the small details for an office Halloween contest. My blazer is an old tweet coat I bought in high school. I’m just happy it fit! Skirt: Any dress skirt will do, really. Mine is an old black skirt that I use for job interviews. I think I even wore it to my C&T Publishing interview. Everything comes full circle. Shirt: A white shirt with a Mandarin collar would suffice. I couldn’t find one, though. Instead, I got a white shell at Target and attached lace around it with a running stitch. The bow tie is ribbon that I also stitched onto the shirt. The shirt was a bit of a splurge, but I know I’ll wear it again. Accessories: For shoes, use black boots or black flats with black stockings. Add white gloves (because Mary Poppins is nothing if not proper), an old-fashioned black umbrella, and a “carpet bag” (i.e. a tote of some kind if you can’t find the real thing). Luckily, my mom had all those things for me to borrow. Hair: Mary Poppins has a pretty simple bun, with the front portion of her hair parted in the center and swept back into the bun. If you’re obsessed with detail like I am, there are some decent shots of the back of her head during the scene where she’s convincing Mr. Banks to take the children to work with him. My hair would not cooperate with me though, even after the 24 bobby pins, 2 Spin clips, 1 pony tail holder, and 1 comb. In my epic battle with my hair throughout the morning, I thought to myself “Julie Andrews always looks so perfect in the film … I bet it’s a stupid wig!” And I was right! Go figure. Practically perfect, indeed! Makeup: Mary’s got pretty but simple makeup. Rosy cheeks (blush), highlighted by not colorful eye (black eyeliner, neutral eye shadow), and a relatively bold lip. I saw a lot of Mary Poppins Halloween costumes with a bright red lip. I think that’s a mistake. In the movie, it’s more of an orange red. Red red just doesn’t translate as well (at least, I don’t think it does).